You can create a lot of rich sounds when you play the digital keyboard, but to truly achieve a full and dynamic sound, you’ll need to use pedals. Typically, many pianists are familiar with the traditional pedal setup, which consists of sustain, sostenuto, and una corda (soft) pedals. Fortunately for digital artists, these pedals have been successfully emulated on digital keyboards so that pianists can add a significant amount of articulation to their produced tones. With the raw amount of pedals on the market today, it can be a bit daunting to try and find a good, well-rounded device for use with a dedicated digital keyboard. I’ve concluded that the M-Audio SP-Triple is an amazing device that’ll enhance your digital piano play significantly. Feels sturdy and dependable under the feet, compatibile with a wide variety of instruments, reversible polarity for use with just about any keyboard on the market today. I’ve played the digital piano since I was around nine years old. In the thirty years since my first Casio digital piano, I’ve played a wide variety of pianos and keyboards and consider myself a true lover of the ivory keys. Recently, my Roland RPU-3 sustained its last note, and it was time for me to find a new model. While I loved my Roland, I thought it might be a good idea to try out a new pedal for my home digital piano. As a result of this need, I decided to do a lot of in-depth research so that I can find a quality replacement. As I stated previously, I found that the M-Audio SP-Triple Electronic Keyboard Pedal is an excellent product that will easily replace my previous pedal. I found a wide variety of great pedals that I thought would be perfect; some were triple pedal setups that include sustain, sostenuto, and soft pedals, and some were just sustain pedals, which I tend to use most often anyway. In the end, I decided to stick to what I was used to and grab a replacement triple. I pored over a ton of musician’s websites, visited my local Sam Ash, and even talked to a fellow pianist who has more experience than me. 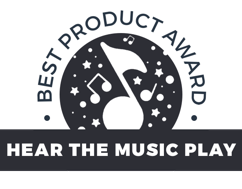 I will feature some of the great products that I tested out and researched so that you can decide which product works best for your piano playing. This is the most used pedal; and as a result, many of the pedal units for digital keyboards tend to only have a sustain pedal. 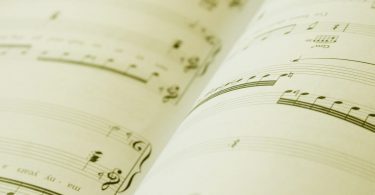 In a standard piano, the sustain pedal’s functionality is locked into the functionality of the acoustic piano. So other strings don’t play when you do this, a damper bar is also placed on the strings, which accomplishes a similar effect.When you depress the sustain pedal, the damper bar is raised and the hammers lift from the string once you strike your key. For example, you want to keep a bass note playing while you play some higher notes. To use the sostenuto pedal in this situation, you’d depress the pedal and play the note then release it. The note will continue to sustain, and you’ll be able to play the higher notes with the bassy accompaniment. This can be used with any note, but for the most part, the sostenuto is best used with bass notes or chords. The material that comprises your keyboard pedal is very important. Consider this: your pedal will have to be strong because you’ll be constantly pressing it with your feet. With this in mind, stronger materials that will ensure that your pedal last will always be valuable for your keyboard experience. Some of the more durable materials are chrome and stainless steel. This being said, some pedals are made of a hard plastic that’s coated in rubber. These pedals can be fairly durable, but your experience may vary based on the brand and the materials used. The pedal design will greatly vary based on the manufacturer. Some modern keyboard pedals use a design that’s reminiscent of the piano pedals of yesteryear; with an up-curving design that’s easy to feel with the tips of your toes. Other pedals have a flat form factor that’s wider at its furthermost end. These are great for providing a larger surface for your feet to make contact with. Personally, I prefer this type as they are typically easier to depress when playing. The final type is more compact and is designed to be able to be packed away without much in the way of jutting edges. These are excellent for keeping your keyboard kit small and easy to carry, so if you travel a lot with your instrument, select this type of pedal. When you are using pedal setup, it’s absolutely imperative that your pedal has a way of staying in place while you play. As a result, the best pedals on the market will have rubber feet that will allow them to adhere somewhat to the floor that they rest on. This way, you won’t have to worry about accidentally pushing the pedal when you use it with your feet. For some triple pedal setups, you’ll be able to attach them to the bass of your keyboard stand. I find these to be very convenient, and it also gives the feel of playing a real acoustic piano as well. Conversely, there are also triple pedal setups that also use the rubber foot design so that you can also use these securely as well. Some instruments have settings that will emulate the other two pedals, so if that’s what you’d like in your piano setup, then there are options out there for you. So which should you choose? In my experience, you’ll really not be using the sostenuto or the soft pedal unless you are an advanced piano player. 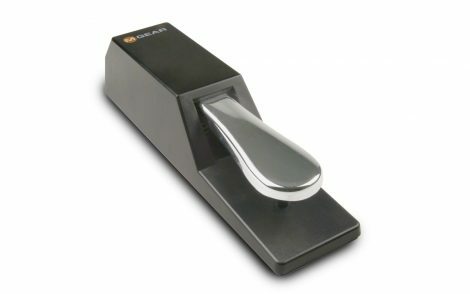 If you are just starting out into the world of digital keyboards, you’ll be fine if you just grab a simple sustain pedal for your playing. A variable resistance sustain pedal is often called a “half-damper,” and these will give you a degree of customizability for your sustains. Each pedal will work under either a negative or positive polarity. 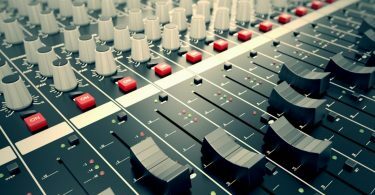 This means that when a keyboard has a positive polarity footswitch or pedal, notes will sustain when you press the pedal. If you plug that positive polarity pedal into a keyboard with negative polarity, then the notes that you are attempting to sustain will stop. This isn’t a big deal, and will not damage your keyboard or pedal, but you want a matching pedal for your instrument. Some keyboards will automatically recognize the difference in polarity and switch so that you can effectively play any polarity pedal with them. Also, some pedals have a polarity switch so that they will also be able to work with any keyboard. In any situation, always try to ensure that the keyboard pedal that you purchase will work with your keyboard. One of the reasons that I really loved the M-Audio SP-Triple Electronic Keyboard Pedal is that it measures up against some of the pedals that I’ve used on acoustic pianos. Many of the triple pedal setups of acoustic instruments can feel a bit cheap under the feet, the result of age or just simply the build quality of replacement pedals. The M-Audio SP-Triple, on the other hand, feels sturdy and dependable under the feet, which was a huge bonus for me. Another excellent feature of this pedal is its sheer compatibility with a wide variety of instruments. The triple pedal has reversible polarity so that you can use it with just about any keyboard on the market today. 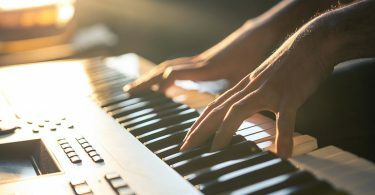 This is very advantageous for me and for other musicians because we can change our keyboards often; either when we upgrade or when we play someone else’s instrument. When either of these things happens, it’s nice to have a device that will be compatible with these types of changeups. A chief advantage that this unit has for more experienced pianists is its tri-pedal setup. This setup is perfect for musicians like me who cut their teeth on acoustic pianos. The three pedal orientation lets you emulate the full experience of a traditional acoustic so that those who can work a sostenuto can really achieve the sound that they want. When it comes to portability, this is a very portable pedal unit. The entire device is only 10.4 inches in width, five inches in depth, and about three inches in height. The product weighs less than two pound, which means that you will easily be able to carry this product to where it needs to go and pack it away with relative ease. The cable for this pedal provides six feet worth of range so that you should easily be able to attach this device to your keyboard setup. As with most triple pedal devices, the M-Audio SP-Triple uses three 3 1/4-inch connectors for each pedal. The bottom of the product is coated in slip-resistant rubber so that it won’t move when you are using it. When you are using this product, you’ll notice how much it actually resembles an acoustic instrument’s pedals. This classic design not only looks traditional, the workmanship on the pedal actually reminds me of some of the pedal setups that I’ve seen on some of the most expensive grands out there. The material is plastic but it has a piano black sheen on it that looks excellent. The pedals themselves are chrome, which means that they look great; even after years of extended use. Finally, one of the most impressive features of this keyboard pedal is its price. Typically for a dedicated triple pedal product you can expect to spend more than $200. 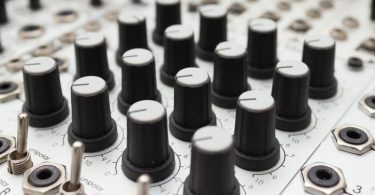 The M-Audio SP-Triple can be found for as low as $55, which is simply spectacular when you consider the workmanship and reliability in the device. I’ll be honest, the low price really was a major factor in my decision to purchase this keyboard pedal. My second choice was the Yamaha LP255 | P-255 Grand Piano Style 3 Pedal Sustain. This particular pedal setup is designed specifically to work with the Yamaha P-255 keyboard, which just happens to be what I play these days. I was actually very close to picking this unit due to its inherent compatibility, but a couple of factors caused the previous entry to win out. First, this is great for your keyboard at home, but if you are doing any sort of traveling this pedal quickly loses value. Sure you can simply have a travel pedal that can be put in a gig bag, but having a fully functional three pedal device that’s portable is much more convenient. The second feature that caused the SP-Triple to win out for me is the fact that this pedal setup is about $50 dollars more. 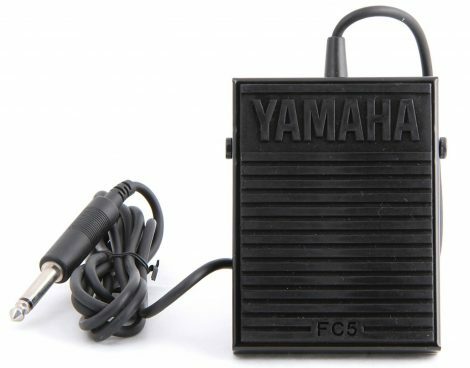 The Yamaha LP255B is very inexpensive compared to some pedals, but the SP-Triple simply won out because of its low cost and high build quality. That being said, the Yamaha LP255B really has a lot going for it. 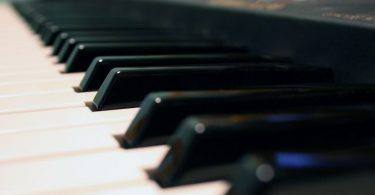 The keys are responsive and have variable resistance so that you can get that half dampened effect in your music. I really liked the overall responsiveness of all of the pedals on this product. The pedals aren’t chrome but they are very sturdy-feeling and durable as well. With such a wide, spade-like surface, it’s easy to find with just your foot and will be very responsive as you start playing on the keyboard itself. I also liked how well-made this product is. As a sustain-only model, you should have a good experience with this product; not matter your piano skill level. You’ll usually be able to find this pedal for less than $30, so it’ll never break the bank. Another in M-Audio’s SP series, this product is designed similarly to our recommended product but is designed to simply provide pianists with a responsive and well-built sustain mechanism. This product is an excellent option for someone who is just looking for a good sustain pedal to improve their pedal skills. 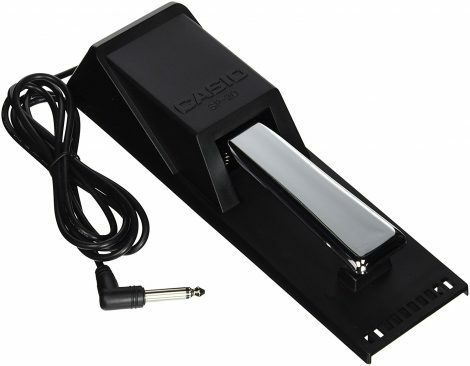 A really great feature of this sustain pedal is the small plastic part which is featured underneath the main pedal. This small part keeps the pedal from fully coming into contact with the base of the device, which in turn reduces wear over time. This is a great life-extending feature that will keep the pedal working like new and it only takes a small piece of plastic. If you are looking for expression, this pedal is fully endowed with a degree of variable resistance so that you can alter the amount of sustain provided for your notes. This being said, the M-Audio SP-2 doesn’t support half-pedaling, which will, unfortunately, cut down on its functionality for advanced keyboard players. I really liked the grip of this pedal; it has a rubber bass that seems to really stick to the floor. I’m not 100 percent sure how it would perform on carpet, but on flat surfaces, it feels like it’s suctioning a bit. When depressing the pedal, there are no squeaks, which is great. For the sake of maintenance and longevity, M-Audio provides a plastic cover for the pedal so that the chrome is protected from incidental wear and tear. This is a specialized pedal unit for the Yamaha DGX-660. While I do not have this particular keyboard, I was able to try this pedal unit out at my local music store. My friend Tasha also has this pedal, and she was one of the people I interviewed. When I tried out this pedal, I loved how responsive it was, and actually considered buying it. The sostenutos that are produced by this product feel very similar to the ones produced on an acoustic piano, and the una corda pedal works very well to subdue the produced notes as well. The pedals are of a traditional type, and as a result, they feel and look very similar to the types of piano pedals that you would see on an acoustic. The sustains that are produced by this pedal device are also very adjustable; there’s even a half damper for you to use in your music. All of the pedals are very responsive to articulation, which is why I found this pedal unit to be very impressive. Finally, the price on this unit is very reasonable; you should be able to find one for less than $75 without too much effort. The next keyboard pedal on this list is the Casio SP20. It is a universal keyboard pedal that is designed to work with a wide range of instruments, so you should not have any issues with compatibility. Another great feature that I really liked is the fact that the Casio SP20 has a polarity switch. Prior models of this pedal have had compatibility issues, and because of this switch, this pedal works universally. 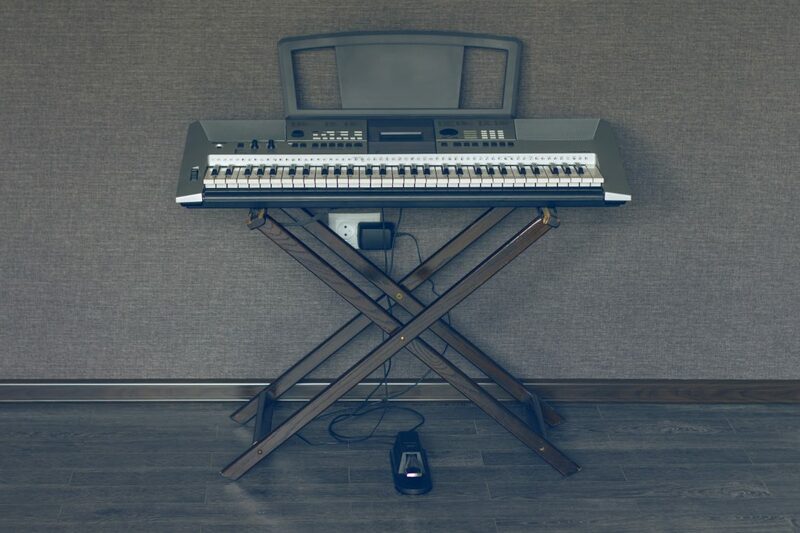 I love how easy this unit is to set up; it is designed with plug-and-play technology so that you can have a sustain pedal hooked up to your keys in no time. It even features an L-shaped plug so that you can keep the keyboard in the position that you want without being required to move it from the wall when you are installing the pedal. The cord on the pedal is exceptionally long, which gives you more options as to where you want to place the pedal. It is a lightweight pedal that has a black finish that will perfectly complement the white ivory keys of your keyboard. The pedal is designed with a nonslip surface, which is ideal for performing on stage. It helps to make sure that the pedal does not slip from under your foot when you need to press it quickly, which means that you can focus on where your hands need to go instead of your feet. Our final product has a very different form factor than our other pedals. Firstly, at only 1.7 inches in height, seven inches in depth, and 4.4 inches in width, this is a very portable pedal. It even has a very light weight; it only weighs about a pound. This means that this product is the most portable pedal for keyboards in this guide. As a sustain pedal, this product is something of a dynamo; it doesn’t sport a chrome pedal like some of the others that we’ve featured, but the footswitch is very sturdy and actually seems to grip your foot so that you don’t slip off of it. For such a small device, the pedal area is very large and is also durable enough to last for many years. The bass of the device is also made of rubber so that the pedal will deftly grip the floor when you are using it. The case for the pedal itself is made of metal, which is perfect for those looking for a stronger and more durable-feeling pedal for their keyboards. The cable is a little shorter than some of the other products that we’ve featured; it’s only about five feet, but I didn’t find this to be much of an issue considering how this will connect to a keyboard anyway. 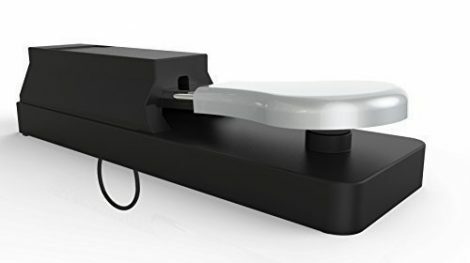 This device really is designed to be a nice and functional alternative to the keyboard pedals that sometimes are included with keyboards, and as a result, it doesn’t look beautiful aesthetically, but that really isn’t a requirement for most digital pianists anyway.